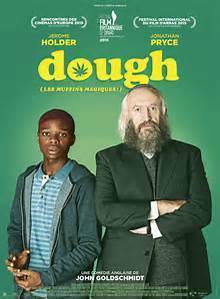 "Dough" is a small 'art' independent film that tries to tackle too many different storylines but shines on the main one. It is a story of an old Jewish baker Nat (Jonathan Pryce) who takes on the Black, Muslim African son,Ayyash, (Jerome Holder) of his store's cleaning lady as an apprentice. Ayyash, accidently, drops the stash of marijuana he sells on the side, into some dough he is mixing and before you know it the bakery that is on the verge of going out of business has long lines and a demand for challah and other dough items. Price and Holder are excellent in their roles with Philip Davis, Ian Hart and Pauline Collins giving strong support in this warm, sometimes funny 94 minute movie. 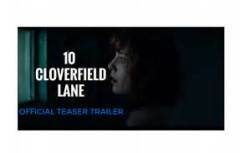 "10 Cloverfield Lane" is a mix of sci-fi, horror, psychological, suspenseful, damsel in distress thriller and survival movie. Fifteen of the last 25 minutes are some of the most tense times I have spent watching a movie. In addition the soundtrack music of Bear McCreary sometimes is annoying but at most times add to what is happening on the screen. Most of the story asks if Howard (John Goodman) has really saved/rescued Michelle (Mary Elizabeth Winstead) or is he a psycho? Have aliens invaded earth making the air inhabitable or is Howard keeping Michelle and Emmett (John Gallagher, Jr.) prisoners for his own twisted reasons? "10 Cloverfield Lane" is not as claustrophobic as "Room" was and certainly more well furnished not to mention more extended with many rooms for a lot more incidents to happen. While the main theme is whether Goodman is crazy or not it really revolves around Winstead who has the audience on her side. Though slow starting at first setting up the story those 15 minutes near the end are worth the wait! "CAPTAIN FANTASTIC"--A MOVIE REVIEW--A WINNER!